My name is Krystle McCabe, I was born in the small town of Tuba City, Arizona. I have lived at Taos, New Mexico most of my life. 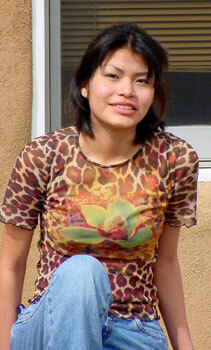 I am half Navajo and half Pueblo (northern Tiwa) Native American. I am currently a sophomore attending Taos High School. I am involved in the following activities' Drama I, Club Art, Taos Talking Pictures, Taos Teen Council, Honest Information Series, Teen Media Conference 2001 and La Plaza Open Studio Youth Project. I am also mentoring with a Taos local artist Claire Haye. Claire has help me developed my artistic talents, she has introduced me to different mediums of art. I love to go dancing at Club Millennium or at raves. I also like to hang out with my friends at "THE BUG," a place where everyone goes to chill, relax and go mud bogging.